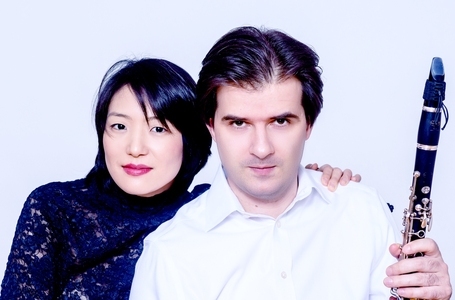 Comprised of two sensationally gifted and acclaimed virtuosi - clarinetist Maksim Shtrykov [pronounced: sh-TRY-koff] and pianist Misuzu Tanaka - the Shtrykov-Tanaka Duo has been heard throughout the U.S., garnering an impressive record of instant re-engagements. Clarinet and piano duos are still rare gems on the modern concert stage despite the immense repertoire. With its innovative programming, master classes, and recitals, the Duo makes it their mission to transform the superb instrumental combination from a rare occurrence to a welcomed guest in concert series across the globe. The 2018-2019 season highlights include the Duo’s debut album release as well as a tour in China with appearances in Beijing, Guangzhou, and Shanghai. The US tour will include concerts at the Ridgecrest Chamber Music Society (CA), Black Hills Chamber Music Society (SD) and Red Scarf Society of the Performing Arts (CA) among others. During past seasons, the Duo performed on many eminent concert series across the country including Chamber Music Society of Maryland, Fairmont Chamber Music Society (WV), the Dame Myra Hess Memorial Concerts (IL), Cedarhurst Chamber Music Series (IL), Rochester Institute of Technology Performing Artists Concert Series, Amadeus Festival (MT), Summer Stars Classical Series (NJ), Frederick Collection Historical Piano Concerts (MA), and Endless Mountain Festival (NY) to name a few. The young duo of Maksim Shtrykov, a clarinetist from Belarus, and Misuzu Tanaka, a pianist from London, are yet another example of a new generation of exquisitely talented performers who elevate our understanding of the world’s music.